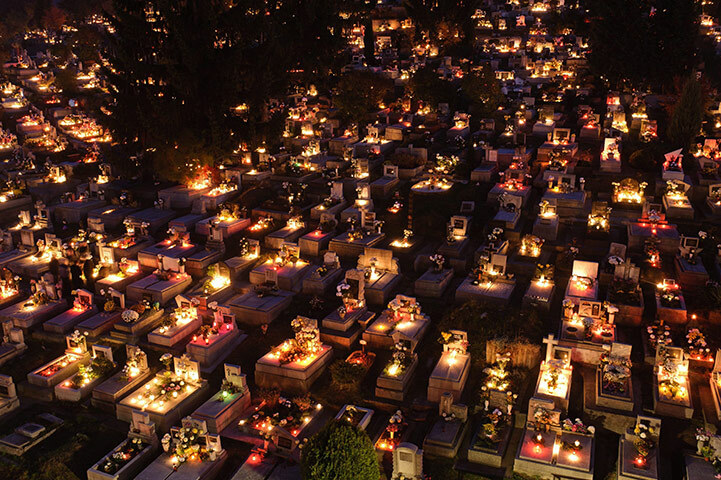 All Saints’ Day is a celebration of all Christian saints, particularly those who have no special feast days of their own, in many Roman Catholic, Anglican and Protestant churches. In many western churches it is annually held November 1 and in many eastern churches it is celebrated on the first Sunday after Pentecost. It is also known as All Hallows Tide, All-Hallomas, or All Hallows’ Day. Celebrated on the 1st November every year in Hungary as an official holiday. It is also celebrated in many central and eastern European countries. All though this day is close to Halloween they are no were near similar. You will not see people dressed up and glorifying the world of the dead. Instead families visit the graves of relatives and friends that have passed. Although a national holiday nothing really happens until the sun has gone down and the dark has descended upon the country. On this eve you will see families leaving their homes with candles and bright yellow chrysanthemums. Everyone is heading to the cemetery to remember those that have passed and decorate the graves with candles and flowers. It really is an amazing site to see. Last year when I went with my boyfriends family I felt uneasy about the experience to begin with. I had never meet the people whos graves I was visiting, but once you step into the cemetery and see all the people, candles and the flowers it truly is a beautiful site to behold. Every time I light a candle I would think of people that had sadly left my life also, but I had a feeling of happiness for them rather than sadness. It was like being there made me understand that they are at rest. Even if you don’t have a Hungarian relative or boyfriend I would really recommend going to a cemetery on this day. Not just to see how beautiful it is but to remember your passed loved ones. I’ve noticed as I’ve got older that fewer of my relatives including myself visit the graves of deceased and quite often even miss the anniversary of their death. i think even if i was to move from Hungary I would continue to celebrate this day in my own way not matter where in the world I may be.